The Army’s 5th Signal Command cased its colors on Friday during an inactivation ceremony, Army officials announced. The ceremony at Clay Kaserne in Wiesbaden, Germany, signaled the end of the command’s 43 years operating in Europe. The command was activated in 1974 in Schwetzingen, moving later to other locations before arriving in Wiesbaden in 2009. Inactivating the command is an effort to streamline the signal mission-command structure overseas, officials said. Some of the responsibilities will go to U.S. Army Network Enterprise Technology Command, with 2nd Theater Signal Brigade handling day-to-day network and communications operations in Europe and Africa, according to the release. 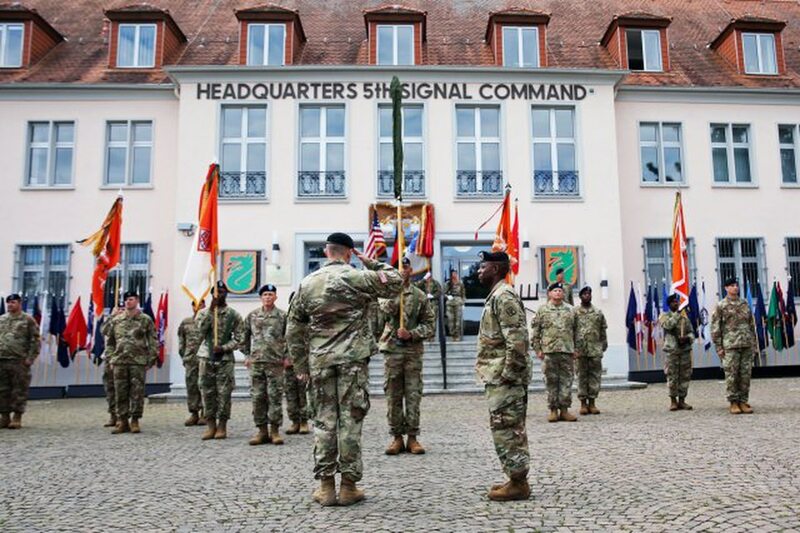 “Our signal and cyber forces of our great Army that serve across the European and African theaters continue and our commitment to mission success will never waver,” Maj. Gen. John W. Baker, commander of NETCOM, said at the ceremony. “The 5th Signal Command Dragon Warriors may be gone, but their impact on signal operations in Western Europe and the Army will live on forever,” Baker said.